One of Miami’s Best Chefs Brings His Chicken Parm to L.A.
Michael Pirolo’s Melrose Avenue sandwich shop also has wings, meatballs, and reimagined mozzarella sticks. Chef Michael Pirolo is going fast-casual with a big focus on delivery at Pirolo’s Panino. But he’s still making food the same way he does at Miami’s Macchialina, the rustic-meets-refined South Beach restaurant that earned him a James Beard Award semifinalist nod in 2016. The funky and fantastic salsa verde for Pirolo’s Italian dip is a combination of anchovies, parsley, hard-boiled egg, capers, and lemon juice. It’s a salsa verde that he’s served with chicken at Macchialina. The beef in the Italian dip is marinated overnight in garlic confit and seasoned with Italian salt before being roasted. 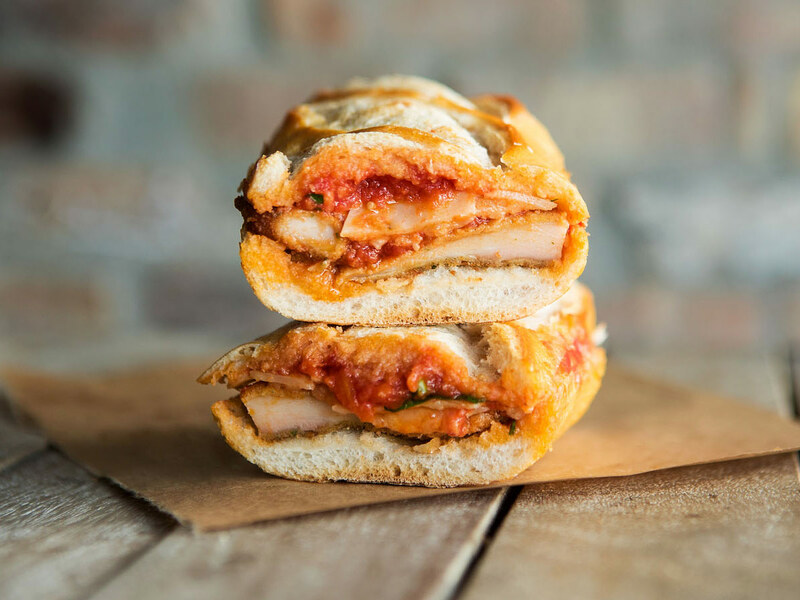 The chicken parm, available in sandwiches, over baked penne, or as a plate with roasted potatoes and broccoli rabe, is made with what Pirolo calls PFM: parmesan, fontina, and marinara. “I feel like the fontina adds such a savoriness and umaminess, as opposed to just mozzarella where it’s there more for the texture and stringiness,” Pirolo says. He’s right. 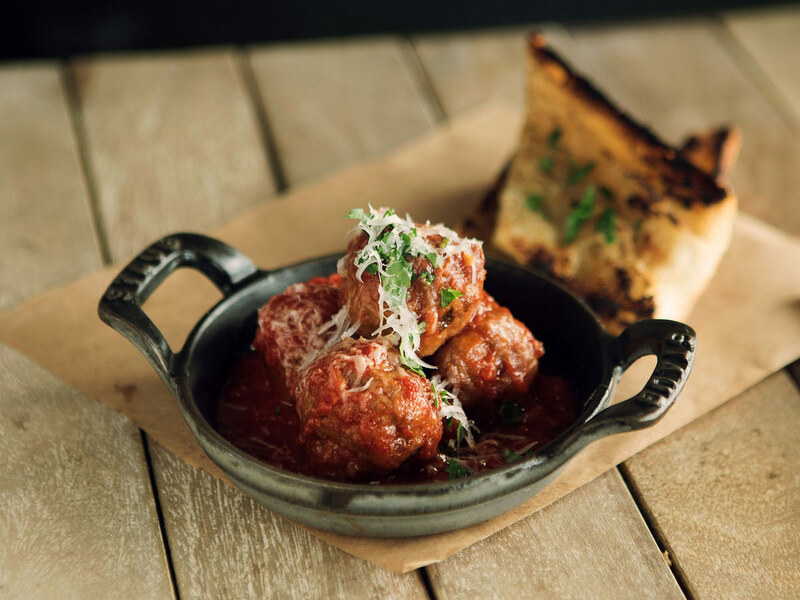 The stronger flavor of the fontina amps up both the chicken parm and the meatball parm. Pirolo, who was born in Jackson Heights, Queens and raised in Avellino, Italy, has lived in Queens neighborhoods including Kew Gardens and Astoria. Over the years, he’s eaten a lot of Italian-American sandwiches and had many discussions and arguments with friends and family about what makes a good chicken parm. “You identify with the place you get your chicken parm from,” Pirolo says. “Are you a sesame-seed-on-the-bun guy or not?" For the record, Pirolo, who researched dozens of L.A. bakers before selecting the ciabatta he’s using, is not a sesame-seed guy. Pirolo and his siblings operate The Saint Austere, an Italian restaurant in Williamsburg, Brooklyn. Every time he goes back to New York, his brother picks him up at the airport and has an egg sandwich waiting for him. Then, lunch is chicken parm at Best Pizza in Williamsburg. The Pirolos are a straight-up New York Italian-American family. But Pirolo didn’t think about serving chicken parm in Miami until a VIP regular, esteemed art collector Dennis Scholl, made an off-menu request. Scholl had no reason to apologize. The chicken parm was amazing, and Pirolo was fortunate that he was asked to make it. He had been thinking about “more esoteric sandwiches” for a pop-up, but he now realized what direction he should go. This is just the beginning of Pirolo’s move into L.A. with his partners, John Kolaski of K2 Restaurants and Giancarlo Pagani of Pagani Projects. There are plans for a delivery-only outpost of Pirolo’s Panino that will serve downtown L.A., plus another brick-and-mortar location in Santa Monica. Pirolo and his partners will soon announce the L.A. address of Massima, a modern Italian restaurant with pastas, pizza, and lots more. Macchialina, where Kolaski and Pagani became frequent customers when they were in Miami working to open the SLS South Beach resort, opened in 2012. It’s turned into an enduring hot spot because Pirolo is a chef with a clear vision about what he wants to create and what voids he wants to fill. Or you can get off a plane and head straight there. Kolaski is the former president of SBE’s Disruptive Restaurant Group. He’s opened more than 60 venues in the last decade, including outposts of The Bazaar by José Andrés, Katsuya, Cleo, and Umami Burger. So it’s not surprising that he and Pirolo, who worked for Scott Conant at Scarpetta in both New York and Miami before opening Macchialina, are planning multiple restaurants. They have a fast-casual pasta concept in the works. The goal for Pirolo’s Panino, in the meantime, is expanding its reach so that customers all over L.A. can call up any delivery app and get a chicken parm sandwich delivered within half an hour. 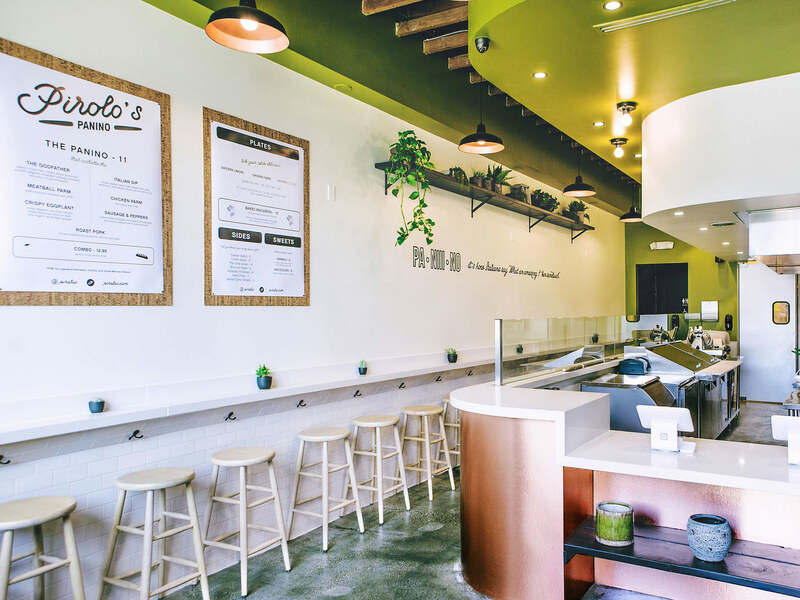 Pirolo is a chef just getting started in a new city, but he’s already deep in the middle of how food is changing in L.A. Pirolo’s Panino is in the former location of Greenspan’s Grilled Cheese, which was run by a chef, Eric Greenspan, who’s now focused on delivery-only menus. Pirolo’s Panino will fulfill downtown deliveries at the same CloudKitchens facility where Greenspan is making the kind of bodega-style egg sandwiches Pirolo loves so much. And of course, there’s Uncle Paulie’s Deli, the excellent sandwich shop that Queens-raised Paul James opened last summer. Technically, Pirolo’s and Uncle Paulie’s are competitors. But there’s also some love here. Brooklyn chef Frank Pinello worked on the Uncle Paulie’s menu. Pinello is the man behind Best Pizza, where Pirolo eats sandwiches whenever he’s in New York. It’s funny, when you think about about it now, how Pirolo was once resistant to making chicken parm despite his affection for it. He had gone to culinary school in Turin, cooked all over Italy, and spent a lot of time considering the strictures of regional specialties. Having an Italian-American restaurant like Pirolo’s Panino means he can color outside the lines. Pirolo’s Panino also has Buffalo wings, made with brined chicken and served with the restaurant’s housemade blue cheese. And there’s something Pirolo proudly calls cheese puffs. The result is a delightful bite that’s more flavorful and airier than a typical mozzarella stick. Like much of the menu, it goes perfectly with Pirolo’s marinara.